The waves’ traces amaze. 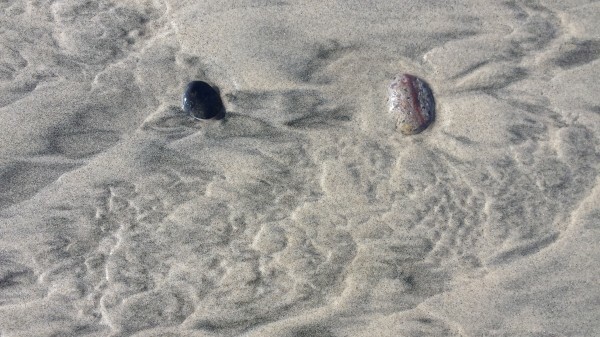 There was a variety of new forms visible in today’s low tide but it was these patterns that spoke to me. Patterns…what patterns are we committed to without even knowing it? What patterns do we make, what patterns do we respond to? What triggers a change in our patterns and how can we be more aware? I think about this when considering my long-standing difficulties with sleep. For how many years did I sleep blissfully eight or ten or sometimes even twelve hours straight? And what has happened to my brain patterns that now a five hour uninterrupted stretch is unusual? What factors triggered this change, and can I modify them? Even more disturbing is the notion that there seems to be a parallel diminishing of focus and concentration. Have I developed a late-onset form of ADD? I seem to flit from one activity to another. An hour seems a long time to do any one thing. I’ll coin a new one: ARADD, age related attention deficit disorder! There does appear to be a connection with physical difficulty as well: my back wants a change of position after an hour — from sitting to standing to walking. Let’s move, it says, I’ve sat enough! Let’s sit, that’s enough time on my feet! I can celebrate one new pattern, though: writing this blog daily, just before bedtime. This one I like!